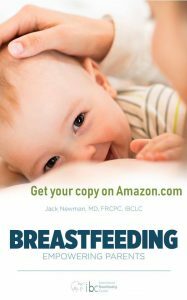 Breastfeeding: Empowering Parents, is a brand new eBook as well as a paperback available from Amazon.com or Amazon.ca or other Amazon websites. The book contains real, practical information for women, their partners and health professionals. In its interactive version, it provides links for further reading and for videos which demonstrate the topics explained in the book. Much of the material includes new approaches and solutions for breastfeeding problems. Many long-held breastfeeding beliefs are exposed as myths. It is worth reading prior to giving birth and also answers numerous questions new mothers encounter. For health professionals, this book will be a treasured reference in their efforts to help breastfeeding women continue breastfeeding when faced with medical issues.